Let me start by saying that I am a newbie on this, trying to do some hobby stuff. I am a software professional trying to interface with hardware (maybe getting into Arduino). 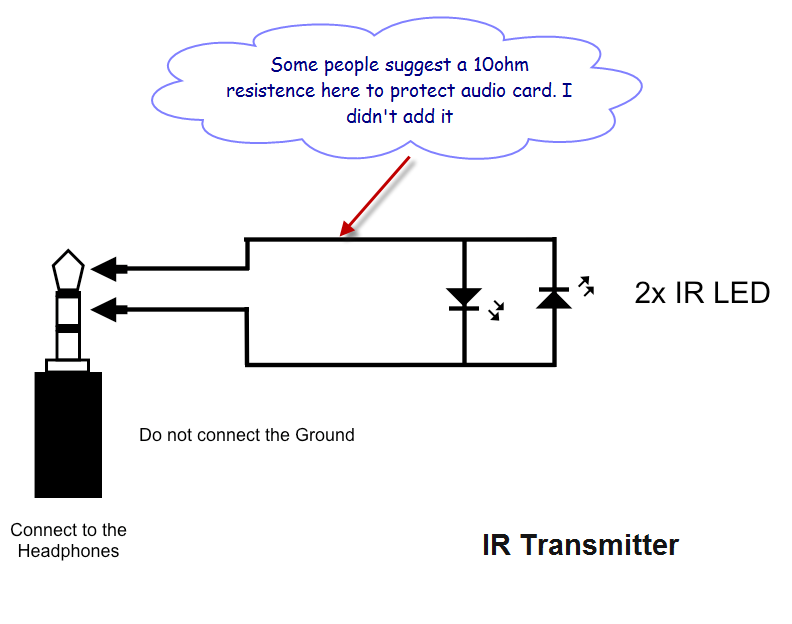 Using this information I was able to build an IR transmitter for an audio device (like my Samsung Galaxy Ace). Using this information I built a receiver for the computer, captured some input from my TV's remote and built the .wav file to play it in my phone with my transmitter. It works. Kinda. The range is very short (maybe 3 feet). Also, I have read somewhere of people adding a resistance because there is a risk of burning the sound card. I have an old set of computer speakers that have their own amplifier. I am considering connecting them to the output of my phone, and connecting my transmitter to the output of the amplifier. I wouldn't mind if the amplifier died in the experiments, but I am trying to prevent my cell from getting killed in the process. So the question is, how do I protect my laptop (when recording with the IR receiver) and my cell phone (when playing back with the IR transmitter) from getting burnt? Note: I know I can just buy the transmitter for the cell phone, but there is no fun on that. This is a hobby project. Interesting design - literally the simplest thing that could possibly work. The risk of damage to the audio devices from this setup is pretty minimal, as there's no external power supply involved. The only question is the current tolerance of the output of the cellphone headphone driver. Make sure all your exposed wires are insulated from one another (tape, heatshrink etc). Adding an amplifier to the system is an idea in the right direction, although now you're at risk of destroying the LED driven by it - extremely likely with an audio amp of any power. I would suggest building a standard transistor LED driver (e.g. Driving LEDs from audio signal ). Use a visible LED first to check it's working then swap it out for the IR one. It's also worth applying volume normalisation to the WAV file you recorded and playing it back at maximum non-distorting volume. Not the answer you're looking for? Browse other questions tagged audio infrared or ask your own question. Simplest Way to Connect an Arduino to Android (Wirelessly)? 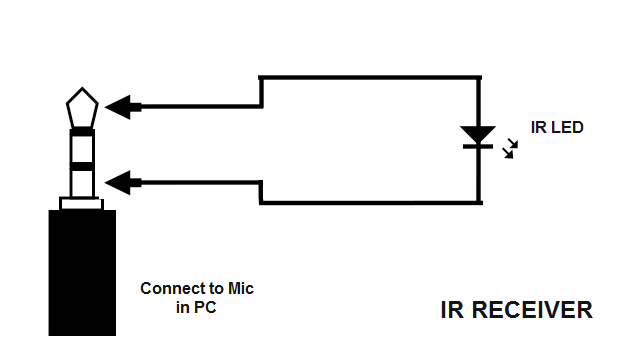 IR to audio converter (frequency and level)?